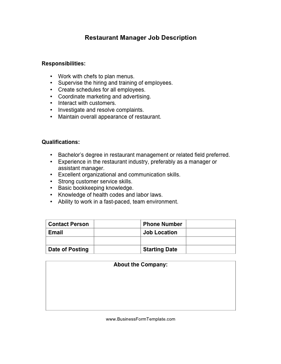 Use this restaurant manager job description to remind staff of their responsibilities or to hire a new employee. Work with chefs to plan menus. Supervise the hiring and training of employees. Create schedules for all employees. Maintain overall appearance of restaurant. Bachelor's degree in restaurant management or related field preferred. Experience in the restaurant industry, preferably as a manager or assistant manager. Knowledge of health codes and labor laws.